It took Alesha quite sometime to decide whether she wanted to be a ghost or a witch for Halloween, but when she heard that her friend from nursery was dressing up as a witch that made her quickly change her mind to becoming a witch for the day! Her Halloween party was Wednesday 23rd October at 4pm, we met our friends at the bus stop and all got the bus together to the nursery for the party. Alesha had a brilliant time, she loved dancing and shaking her bum to all the latest chart music which was being played in the school hall. I done the best I could when it came to getting creative with face paints, I tried to do cobwebs on her face but as you can tell there not quite the same as cobwebs haha. Now she can't wait for Halloween night 31st October to dress up again to go trick or treating and then having a big party. 13 Months And Now Walking! I can finally say that my precious bundle of joy Alana is now officially walking at the age of 13 months. 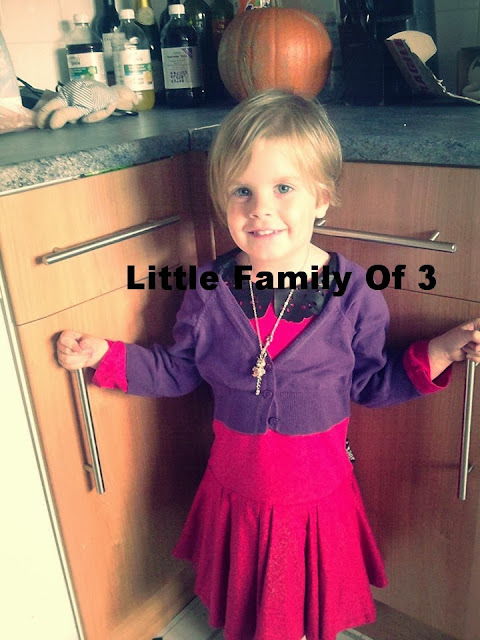 I'm a very proud mother, its been lovely watching her develop new milestones these last few months. Alesha is a proud big sister, keeps giving her kisses and saying "well done Alana I knew you could do it"! Alesha started walking just after her 1st Birthday so not much in the difference between the two of them. Moments like these make me very proud and I'm thankful for each and everyday with them, I'd never go a day without seeing them, there my everything and they will grow up to know how much I love them. These last few days have been abit hard as Alesha has been asking about 'sperm donor'. This morning on the way to nursery she said "mam daddy doesn't love me anymore, if he did he would have come to see me and my baby sister by now"! So I replied saying, "it's his loss darling, you have me who will always love and care for you", to which she replied "please mummy don't leave me like daddy has done, he isn't a nice man he hurt you mummy and made you cry" and then she kissed me leg. Looks like Alesha is understanding what sperm donor is really like after all. He can take money from my kids, and go spend it on his new girlfriend's sons, that's what you call a dirty scumbag. 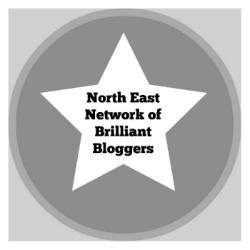 I'm now looking forward to the next few month's seeing Alana and Alesha progress more. Alesha has got her Halloween party at nursery tomorrow so she went to bed really excited tonight. Whether it is trick or treating, parties or something tasty for you to share with friends, this range of themed sweets is perfect for every Halloween occasion. Alesha's face lit up when she opened the large Trick or Treat Bucket which contained 40 mini bags of sweets. 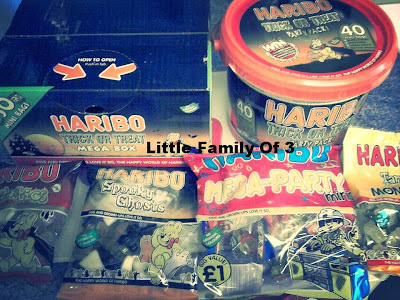 "WOW mummy look at all of these yummy sweets" she said with a smile too big to wipe off her face. Haribo's Halloween Bucket is available from Tesco, this cauldron of delights contains 40 mini-bags of Halloween themed goodies. Also available in the bucket are a selection of terrifying extras that will get any Halloween party started. These include a suggestion of scary games, petrifying glow-in-the-dark stickers and a medley of bloodycurdling invites. 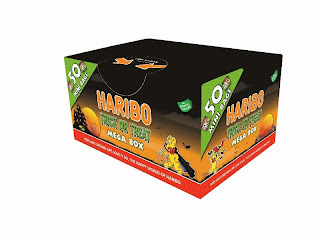 The Haribo Halloween Bucket also has an extra suprise - the chance of winning an Ultimate Haribo party, which includes a guest appearance from Goldbear, games and party food, OR one of 100 Haribo party hampers. Winning tickets can be found inside lucky party buckets or you can enter online. Simply visit http://promotion.haribo.com/2013_UK_Halloween/ and follow the party fun link. This evening me and Alesha sat down together and decided to tuck into the bag of Spooky Ghosts jellies. Alesha was happy taking one at a time out of the bag and looking at the ghostly shaped jelly, after eating a few she decided to play a spooky game with them. The one sweet was my favourite as it had a zing of orange which my taste buds really enjoyed. Haribo have also created something completely new for you and your friends to sink your teeth into - Fangtastics. Available in 200g sharing bags from Tesco, Fangtastics have that same great 'tang' flavour found in Tangfastics, but this time with a bit more bite! 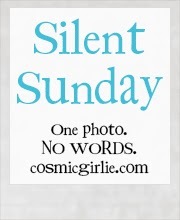 Also great for parties, this themed pack is perfect to tip into bowls for sharing. The Trick or Treat Mega Box we received for review has been put aside for that spooky night 31st October for all the boys and girls (ghosts and witches) that knock on our door. 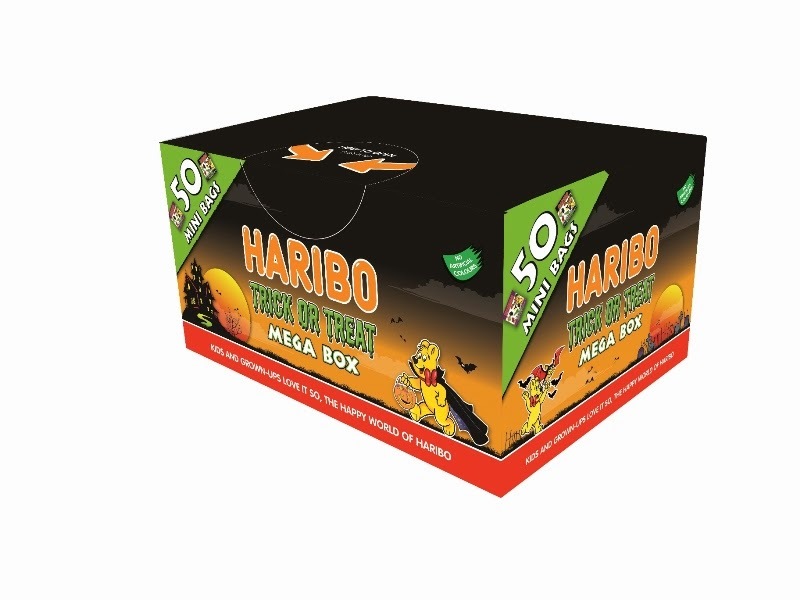 These Mega Boxes are available from Asda and contain 50 individual mini bags of Horror Mix - spooky themed gums and jellies that create a delicious bundle of treats for all those wizards and witches that knock on your door. I was sent these jellies for the purpose of this review. For the last few months Alesha has been getting these cysts on the bottom of her eyelids but after a few days fade away but just over 2 months ago they came back and haven't budged since. She now gets them growing on the inside of her eyelids so there on her eyeballs which can be irritating for her at times. The doctors gave me antibiotics which didn't work so I went back and then I was given eye drops to try which didn't work also so she was transferred to Sunderland Eye Infirmary hospital. 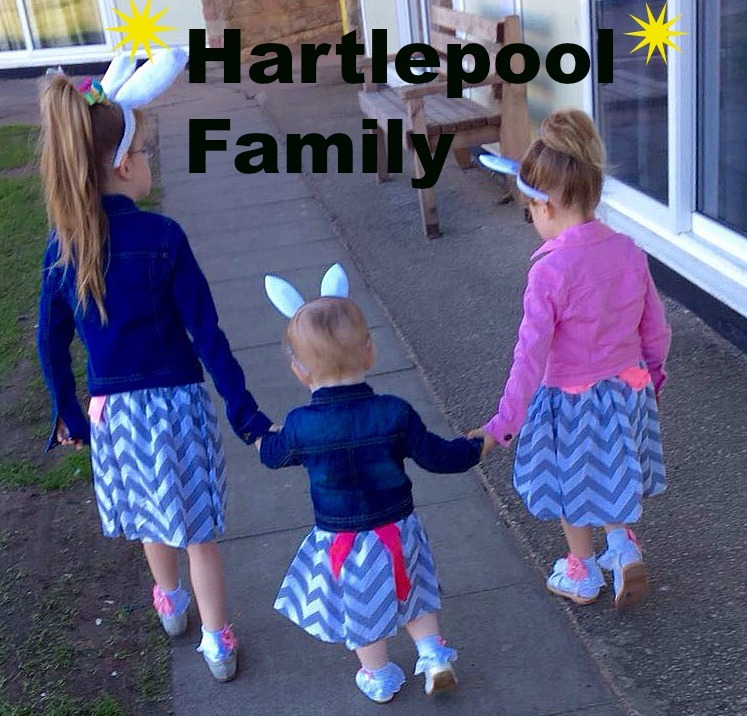 My mother and her partner Peter took me and Alesha to the hospital as it's quite a distance from our house in Hartlepool so would be a pain to get public transport. We had over a 2 hour wait for Alesha to be seen to, but I can't complain because Alesha was good as gold and made us and other patients laugh whilst waiting. We were all sat nice and quiet and then Alesha says "Pete do you want to come for a walk, come on"! So Pete took her hand and she led him over to the vending machine asking if he would like a drink while were waiting, haha my little madam. Pete got her a drink and she happily sat sipping away until she decided to go over to the bin to put some paper in which she found in her coat pocket. She placed her foot down on the pedal to open to lid of the bin, she done it 3 times so I said "Alesha come over here and sit down please" to which she replied "mum I'm just getting some fresh air", made us all laugh out loud, bless her! Finally, it was Alesha's turn to be seen to, she had an eye test done which revelled her eye sight in one eye was poorly. The doctor then had a look and informed me that the red lumps on her eyes that keep going and coming back are called cysts that he was making a hospital appointment for Alesha to see someone else that in the meantime just keep bathing it in warm water until we get an appointment through in the post. Alesha was over the moon when I said the postman had brought a very special surprise for her when she was at nursery. I gave her the parcel to open and she ripped the paper of with excitement eager to know what's inside and then her beautiful eyes lit up with happiness when she seen Baby Annabell. 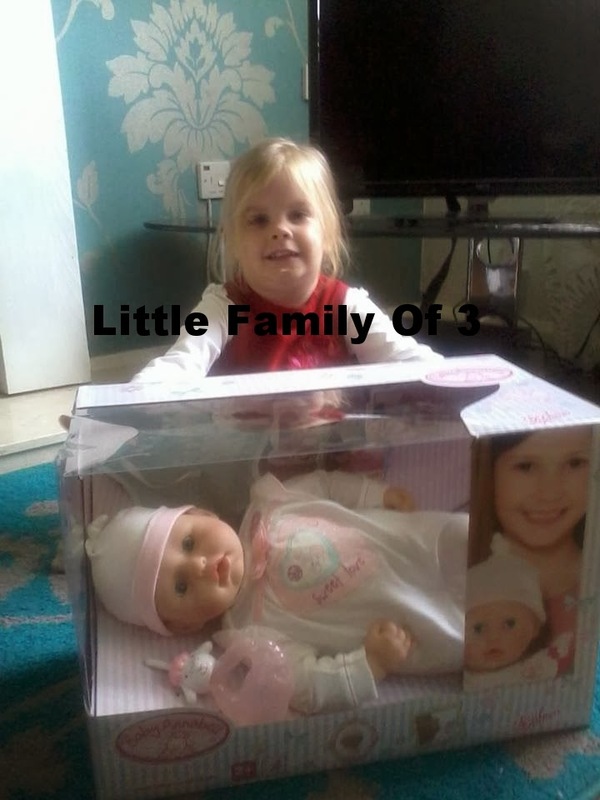 "Baby Annabell" she said raising the tone of her voice, "I've seen you on Tv and having been wishing that Santa gets me one, I'm so so happy now, thanks mum"! So right from the beginning Alesha was very happy with this doll. 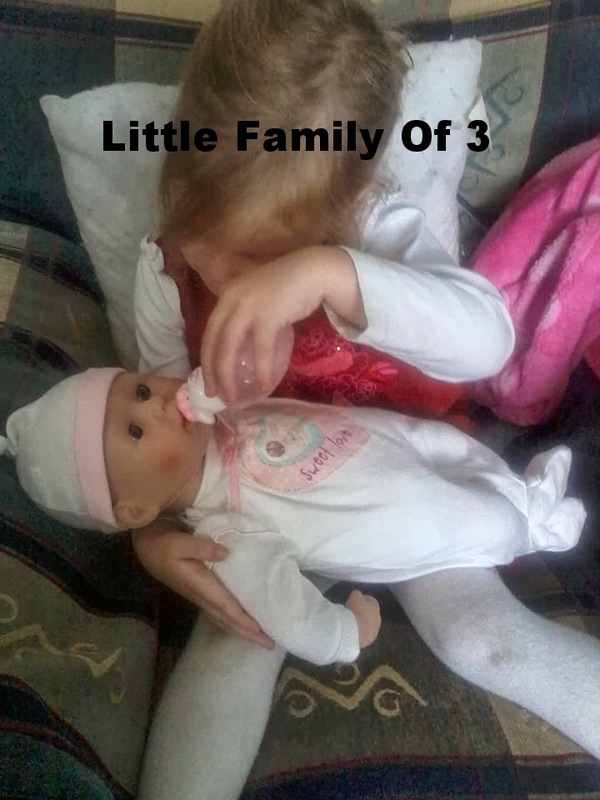 After I put the 4 AA batteries inside which was easily done I done switched her on and right away she started babbling and sounded so realistic just like my youngest daughter Alana. 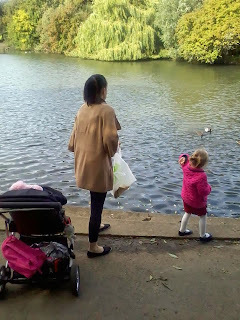 Alesha went and filled up the bottle with water and got stuck in feeding Baby Annabell. This doll drinks real water from her bottle and when she's full your child your child can pat her on the back to make her burp. When it's time for bed, this doll will yawn and close her eyes, while your child soothes her to sleep with a gentle lullaby. Alesha will not part with this doll at all and has pushed aside her once o so favourite doll Polly. The most fascinating thing about this doll is the real tears from her eyes, Alesha keeps wanting her to cry haha! I was sent this doll for the purpose of this review. My Kids Are Not Being Let Down Again! As I see this as an online dairy for my daughters to read back on when they are older, I therefore like to express my feelings and write about things that happened. It's going on 4 months now since sperm donor (I will never call him by his name nor give him the opportunity to be called dad) threatened to kill me and my family then packed some of his stuff and walked out the door on me and his daughters. Today I finally realised what he really is like and who he really is, I am so thankful that he is out of my life for good, no more bruises, no more me having to call the police, no more me having to tell him to stop shouting or leave the house. 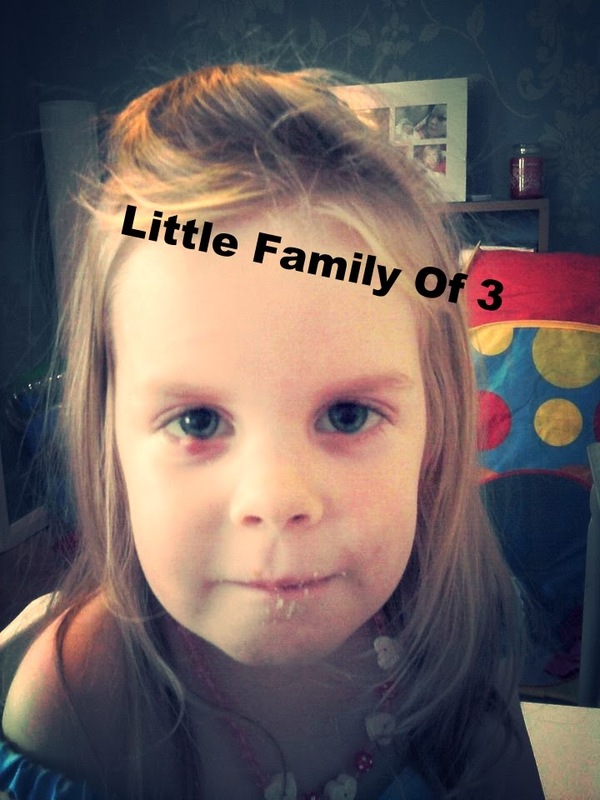 BUT, because I have a heart and I care about my girls I decided to send sperm donor's mother a message on Facebook and ask her to contact him and tell him to contact me about seeing his girls that this was his last chance as he has let them down before and hasn't bothered seeing them since we split. I got a text from him saying he would like to see them but he is stuck down in his cousins house in Dewsbury that he is skint and has no money, so I asked him if he would like me to put £30 for petrol money into his bank if he was going to call up that evening to see the girls, so he said yeah. I took Alesha nursery Friday morning and then went out of my way for him by getting the bus into town with Alana so I could go into the bank and put the last bit of money I had which was £30 into the bank for him. I then told him it was in and surprise surprise sperm donor decided to switch his mobile phone off later that evening. Then the following morning I received a text to say he was 'too busy'. So I asked him how can he be 'too busy' to come and see the girls after he promising me he would if I put my last bit of money into his bank. But he had no answer for me! I then told him how much he was breaking Alesha's heart promising her he was coming up to see her, so she went bed really happy and then the next morning me once again had to break the bad news that he wasn't coming up and he told a big lie but not to worry that she would always have me as mother and that's all she needs because it's me who is loving her, it's me who is wiping her tears from her face when she is upset and it's me who will always be there for her whenever she needs me. I would never be 'too busy' and break my daughters heart like that, nothing or no-one should be more important the your own children! The following morning I received a text from sperm donor saying he would call up that day and to cut the long story short the waste of space, the money grabbing ba*tard let his daughters down AGAIN! That night I realised I was running out of baby soya milk for Alana so Itext him and asked him to put the money back into my bank as I need to buy some baby milk for Alana that I had no more money until I got paid and the heartless piece of so and so did not reply! But what makes it more interesting is he can go meet another woman down there and go have fun with her sons, when his daughters are sat at home wanting to see him! Not in a million years is he getting another chance to see my daughters, using them as an excuse to get money from me, he is an utter joke looks like sperm donors family have turned their back on my girls aswel, not even a birthday card on Alana's 1st Birthday, haven't even asked about them since me and him split, but luckily enough my girls are surrounded by people who love them and that will never change. Today I took Alesha's mind off thinking about him and took the girls to the pond to feed some ducks and then for a play in the park. Look forward to the future with my beautiful daughters, bring on Christmas haha!